A “learning garden” and training centre is currently under development at Kakojan College, about 15 km. east of Jorhat, a major agricultural and tea growing area in Assam. 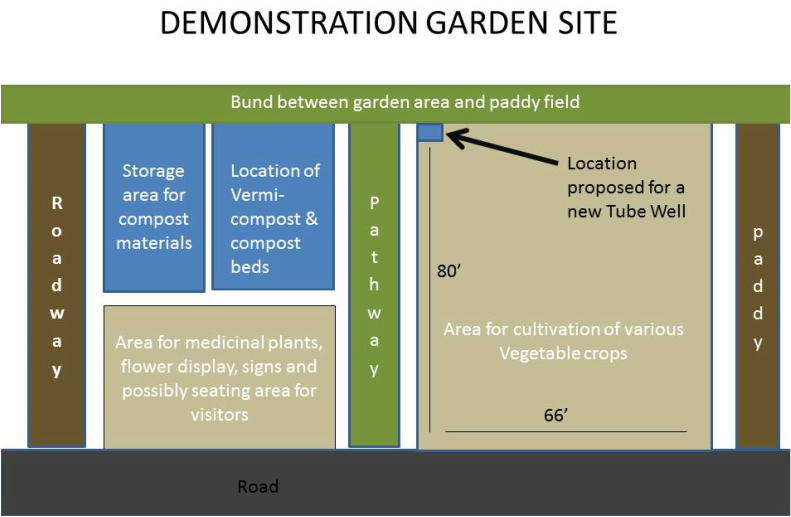 Local vegetables, fruit and grains will be grown on the site - and orientation and training in cultivation, marketing and production of organic inputs will be provided by resource people familiar with the principles of sustainable organic farming. There is a small plot of land adjacent to the site for organic tea cultivation, and space is available to erect a small-scale processing unit to promote the cultivation, production and marketing of organically-grown tea by the area’s small tea growers. 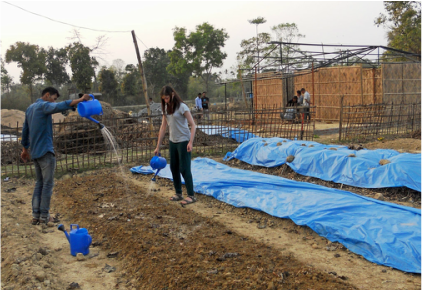 Staff member Pabitra Bora and Grace Young, a volunteer from the UK, water seeds of "green manure" plants. Before flowering, the young pea,, rice, chana, dhania and other plants will be cut and turned into the soill, adding nitrogen, much-needed organic material and other nutrients. Kakojan College has expressed interest in launching a certificate course in Organic Farming in future, and a number of options for making this possible are being explored. The project is being carried out in partnership with North East Affected Area Development Society (NEADS). Financial support has come from Rotary Clubs in District 5020, Jorhat Rotary Club (District 3240), and donors in Canada and the US. Technical support is being provided by Fertile Ground: East/West Sustainability Network, a voluntary organization from Vancouver Island, Canada that has worked to encourage sustainable and traditional farming and tea cultivation in Assam for the past 12 years. These days, there are few local employment opportunities for students graduating with degrees in fields such as Computer Technology, Engineering, English or Political Science. As a result, many young people from farming families are moving to the cities or leaving the state, and local food production is steadily declining. Intended beneficiaries: Students, farmers, small tea growers, families from the adjacent area, self-help group members, educators and local NGO’s. How this project will benefit the community in need: Participants will become familiar with the principles and practices of organic farming, explore a range of self-employment opportunities, and develop skills which will help meet the growing demand for knowledgeable farm, tea garden and educational outreach workers. To ensure ongoing sustainability of the project, an annual operating budget and a plan identifying potential income-generating opportunities will be developed. This may include activities such as the sale of local organically-grown vegetables, fruits, rice and tea, the production and sale of natural soil amendments and insect repellents, and conducting tours and training to farmers, school children and members of local self-helps groups.